In December 2017 , ELD Devices for trucks became a requirement as a results of the ELD Mandate. In April 1st, 2018 the department of transportation began strict enforcement. There is a greater accuracy than paper logs when you compare it to other non-ELD logs. There is a great driver communications and accountability. There is greater productivity with less time spent on the management of Records of Duty Status (RODS) When it comes to ELD devices solutions for trucks, they are as good as the network they are running on. The U.S Cellular signal is stronger even in places of middle in nowhere, as their towers are in places where a majority of wireless providers do not have their towers. It should be able to provide separate ELD user accounts, one for the administrative and one for the drivers. And it should automatically record the driving time in intervals of 60 minutes. The record should contain: the driver’s identification, time, location, records date, vehicle miles and the engine hours. Its time is synchronized with UTC that is the coordinates of universal time. The driver should be able to get a copy of his/ her records; it could be through an electronic file or printout. It should require a driver’s certification of those driving records after 24 hours. ELD solution should either be able to support telematics data transfer or local data transfer. That is through the web services or email and the use of Bluetooth or USB2.0 respectively. Should not allow tampering of information by erasing or altering it, as the collection of data is for the driver’s ELD records. Ought to be able to retain data of the current 24 hours for the last 7 consecutive days. It requires the driver to review unidentified driver records. The driver can either accept assignment of the driving time, or show that the records do not belong to him. It shows all standardized data that you need, which is able to authorize the safety officials when required. This is done through a printout or a screen display which includes; a graph grid which shows the driving duty status changes, a detail log data and a daily header mainly. In the event that you print the graph grid, it must in the very least be 6 inches by 1.5 inches. When choosing an ELD solution, ensure that they meet all the ELD specifications plus they are on the FMCSA’s list. The above list indicates some of the features that an ELD must have; the vendor can verify it for you. You can take some time and research the ELD, check with the Better Business Bureau; also you can check the vendor’s online reviews for their customer service plus products. 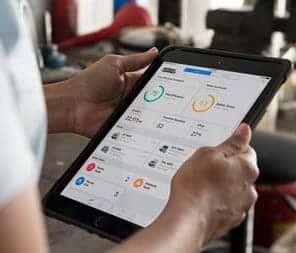 How to Choose a ELD Device for trucks? A majority of fleets are not aware that the automatic onboard recording devices (AOBRDs) are grandfathered under the new ELD mandate. Fleets with onboard will use them only until the 16th of December 2019, where they are to use an ELD. Automatic onboarding recording device is a hardware which connects to a vehicle’s engine in order to record a driver’s HOS. The onboard records the date and time, vehicle miles, locations, drive times, duty status and engine hours. Onboard is able to show the edit history, which is, who made an edit and when the edit was made; it does not readily show the edit history. When it comes to the driving time the onboard device, allows editing of the driving time in the event that it’s attributed by a wrong driver. The onboard records a location in each change of duty status, it can record the information manually. They are not as restrictive as the ELD, this is because; with onboard it is not necessary to change the duty status as long as the vehicle is not in motion. What are ELD Devices for trucks? ELD Devices, also called electronic logging devices, are devices which record the hours of service. Those devices are not to be confused with on board recording devices. The information that eld devices tract includes; logging in and out, engine off and on, duty status and malfunction. ELD devices for trucks are able to record who and when an edit was made. All the edits made require an annotation. The automatic record of events cannot be different but it can annotate. The ELD device readily shows the edit history to the DOT inspectors. It is very important to note that ELD devices restrict the driver from editing the driving time. Those are very different from the traditional paper logs. The ELD automatically records the location when; there is a one hour interval while driving, at the start and the end of yard moves plus personal conveyance.Determine the location accuracy, when a driver is driving within a one mile On-Duty and 10 miles when on a personal conveyance. ELDs are more restrictive compared to the onboard, as they automatically switch the driver’s duty status to” On-Duty, Not Driving”. When the vehicle does not move for the next 5 consecutive minutes, or when the driver does not respond to the prompt within one minute. The FMCSA introduced the Electronic Logging Devices (ELD), which the drivers are to utilize to record of duty status (RODS) regulation by the 18th December 2017. The ELD are the latest technology and are more sophisticated than the outmoded onboard. ELDs are advanced than the onboard and are to automatically capture the RODS data. This is to be done automatically at every 60 minutes while the vehicle is in motion, at every duty status change, at the beginning and the end of personal use and yard moves; plus when the engine power is on and off events. The ELD mandate of new regulations and standards, are more detailed compared to the previous regulations. The ELD mandate requires an increase in awareness to the commercial drivers. Also, it requires a lot from the fleet managers and owners. As a result, the mandate requires that the onboard ought to be replaced by the ELD before the end of the extended date deadline. According to the new regulation rule 395.8, CMV can continue to use the onboard until December 16, 2019. After the 18th December of 2017, you will not be allowed to purchase a new onboard and install it into a new vehicle. Although, you can use an onboard that was used by another CMV. Additional Info Click Bellow To Get Help with finding the right ELD for your business . In addition, find out more about the Tax write off. Further, ELD manufactures range from small firms to industry giants. We at ELDDevices.Net are here to help you choose the right ELD Devices for your trucks. We review the best ELD Devices Rating & ELD Reviews as well as a complete ELD Buyers Guide.